We often think of idolatry as something like praying to a stone carving or being overly interested in sports cars, but modern-day idolatry can involve more subtle and nefarious "false gods": religious leaders. "I am justified in wanting this expensive dress because it is important to wear my Sunday best to church to show respect to God. Also, I worked hard to earn the money for this dress, and hard work and self-reliance are important to God. My money is also a blessing from God because I pay my tithing, so this dress is a blessing." "God is love, so restrictions on when/who/how we romantically love are not of God." "God speaks through prophets, so I should obey and trust everything the prophet says. God also deserves my respect, reverence, and gratitude, so I will show that by being respectful, reverent, and grateful to his prophet." The problem with this way of thinking is that it uses God and His priorities to justify our own desires. We use God to rationalize our idolatry, making Him in our own image. "How is obeying and reverencing our church leaders idolatrous?" This behavior becomes idolatrous when the object of obedience and reverence is a mortal person instead of God. We should obey the commandments of God and reverence God, not His servants. Of course God's commandments often come through His servants, but it is important to understand that God is the one we are obeying. His servant is merely the messenger; the message and commandments should not originate with the servant, therefore the obedience is not directed toward the servant. The chasm between men and God is vast; putting church leaders on the same plane of deference and adoration is blasphemous and a violation of the first of the Ten Commandments: Thou shalt have no other Gods before me. We cannot bring God down to us by designating earthly substitutes for our worship. We must ascend to God on His terms. God did not say, "If ye love me, adore my prophets and lavish them with honors." He said, "If ye love me, keep my commandments" (John 14:15). 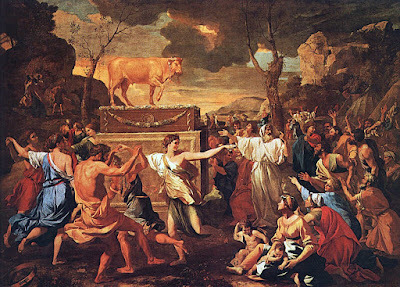 Idolatry is when we substitute something telestial, fallen, and carnal, for God. Are we expected and encouraged to participate in excessive physical displays of reverence and admiration for our leaders? Standing when the prophet enters the room, singing hymns for him, and even dancing for him? While I can't think of any instances of members literally bowing down to church leaders, we often use the symbolic and sacred phrase "at the feet of" when referencing the "honor" of being taught by general authorities, especially in person. We're just showing respect! you might say. Really? Do you stand when your Bishop enters the room? Do you sing for your boss? Dance in costume for your favorite professor? Common respect looks very different from the adoration and worship we Latter-day Saints reserve for our favored religious authorities. In this passage Jesus highlights the tendency of the Gentiles (among whom Joseph Smith identified the Saints in D&C 109:60) to idolize those "that exercise authority upon them," and then completely rejects that tradition. The Lord's apostles are to be humble servants, not oligarchical, authority-wielding celebrities endlessly praised for their service (and is it really service if they are paid?). When you receive a gift in the mail, do you send a thank-you note to your mailman? No, you send one to the person who is actually responsible for the gift. Prophets are basically mailmen. Do you treat your mailman with basic respect and civility, and perhaps a simple expression of gratitude when you happen to see him at the mailbox? Sure. Do you throw him celebrity-hosted birthday parties? Do you keep a framed photo of him on your wall? Do you encourage your children to write in their journals about him? No, because that would be weird and completely disproportionate to their personal importance in your life. When we rationalize the same honors for our church leaders, that's a strong sign that we have come to prize the messenger more than the message, and that such adoration has become a dangerous distraction from God. If you aren't faithful enough to get the initial message from God Himself (eventually you should be), then God will utilize someone else to pass on His truth. This method is merciful and loving, but we should never lose sight of the fact that the real value we receive from prophets exists completely independent of them; God's truth and work depend on no specific, mortal man. If one prophet dies, fails, or rebels, God can use another. Prophets are replaceable and interchangeable. Their worth is not in their heart-warming anecdotes, their sophisticated speech and accomplishments, or their likable personalities; their worth to us depends solely on their ability to receive and transmit God's word. Why should we care if the prophet "sends his love"? Why should we care when his birthday is or what he likes to eat? Why should we learn anecdotes about the General Authorities' righteousness, rather than hear stories of their witnesses of God's power? Why should we place extra value on their examples, when we have Jesus Christ as our example? "But loving, celebrating, and learning about our leaders aren't harmful!" The fact is that life is generally a zero-sum game when it comes to time and resources. The time and energy you spend learning the GA's birth places and hobbies with printable flashcards could have been put towards studying the scriptures or serving someone in need. Of course the same could be said for each moment you spend on Facebook, pursuing a hobby, or exercising, but what's especially problematic about more subtle idolatries is that you give yourself credit for doing "something spiritual." Because "honoring the prophet" is equivalent to "honoring God" in your mind, you are okay spending an hour at church learning about all the great stuff a former church president did, feeling no alarm that the name "Jesus" was only mentioned during the opening and closing prayers. You feel like a good Mormon if you read a prophet's biography on Sunday afternoon, even if it means you didn't crack open your scriptures. You feel like you have "taught the gospel" to your kids when they've memorized the names of the Quorum of the Twelve or can sing the latest verse of "Follow the Prophet" (the anthem of Mormon idolatry). The fact is that living the gospel has nothing to do with following or adoring or learning trivia about our leaders. Living the gospel is about following CHRIST and obeying GOD. Beyond the expenditure of time and resources, what can be most nefarious about idolizing our leaders is that it leads to outsourcing our relationship with God while also dulling our ability to discern truth from fiction in what they say. When you idolize your leaders and put them on a pedestal, questioning the veracity of their teachings becomes taboo. Questioning a man becomes as offensive to you as questioning God, a sentiment that is in direct conflict with the Lord's declaration that, "Cursed is he that putteth his trust in man, or maketh flesh his arm, or shall hearken unto the precepts of men, save their precepts shall be given by the power of the Holy Ghost" (2 Nephi 28:31). I wrote more here about our duty to verify everything by virtue of the Holy Ghost, and not by our level of admiration for the messenger. If you can't wrap your head around the idea of our leaders teaching us anything but pure truth, read this to see how the teaching that "the prophet can never lead us astray" is a false precept. Why was this picture staged this way? Why wasn't a simple headshot used to announce a devotional? In these verses the Lord is 1) establishing that it is possible for one of his ordained servants to deliver a message that is not of God, and 2) explaining that it is necessary to receive a message through the Spirit of truth (as opposed to "the Spirit of loyalty to your leaders" or "the Spirit of admiration for nice elderly men" or "the Spirit of warm-fuzzy groupthink"). Carefully examine your standards for evaluating the truth of the messages you receive from your leaders; it is telling if you have no such standards. "Even if these things are idolatry, what the members do is not the fault of the leaders!" Maybe not, but I wonder why they don't denounce such behavior and adoration as idolatrous. What would you do if President Monson walked into the conference center and said, "Sit down! I'm no one special. All your reverence should be reserved for God. In fact, why am I sitting in a chair comfier than yours? Why is anyone who isn't speaking in this meeting sitting behind the pulpit? And why all the memes praising me and other general authorities or the vapid things we say? They are vain and trifling, offensive to a jealous God. Stop acting like I'm a superhero, stop thinking it's an honor to be in my presence, stop putting my picture on your wall, and stop caring about anything I say or do unless I say I have a message specifically from God and that's confirmed to you by the Spirit. Oh, and don't read my biography, To The Rescue. You'd be much better off reading the New Testament--now there's a biography worth your time! Now for my talk, the content of which was provided me by an angel who visited me last night..."
Do church leaders encourage and enjoy the adoration they receive from members? Does the church foster idolatry by promoting a cult of personality surrounding leaders? A cult of personality is the deliberate curation of an individual's public image through flattery and praise; positive traits and stories are emphasized while potentially negative traits and events are erased or minimized in the authorized narrative. The church certainly created an idolized mythology around Joseph Smith ... is the same true for current leadership? What emotional reaction were the producers of this photograph aiming for? General Conference is this weekend. If you're watching, I hope you'll evaluate each message on its own merits, and not based on your feelings for the speaker. -"God instructed me to say ..."
-"An angel revealed to me ..."
-"In a vision I saw..."
-"Thus saith the Lord ..."
-"The Lord said to me ..."
-"The word of the Lord ..."
-Flattery, especially directed at women. -Boasting about the accomplishments of the church, missionary force, or leadership. -Anecdotes that highlight the righteousness of an individual rather than the power and mercy of God. -The philosophies of men, mingled with scripture. Follow Jesus Christ alone. Only He can save you. You bring up some good points but I feel like you went a little bit extreme in some areas. For example I love reading biographies of good inspiring people. I don't replace it for my scripture study then I think it might be idolatry. But it is inspiring to me and uplifting and better than reading some sappy romantic novel like a lot of girls my age read. Also comparing the prophet to a mailman isn't on the same playing level at all. A Prophet gives up all their time and commits himself to the rest of their life to serve the Lord. That is why I would gladly stand up when he enters the room. 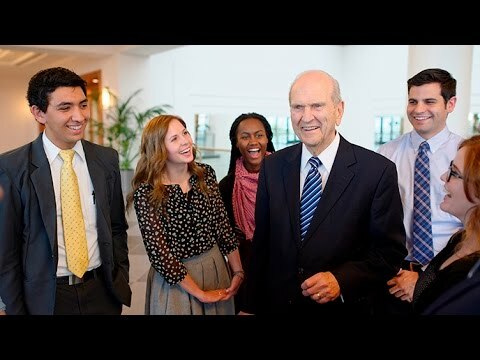 Not because I want to bow down before him and say all hail president Monson but because i want to show a deeper respect for him because I'm very grateful for the sacrifice he's making. I don't think it has to be so black-and-white that if I stand up for the prophet that automatically means in my heart I'm worshiping him and not remembering the Lord. I believe I can stand up to reverence the sacrifice our Prophet makes and in my heart praise the Lord for sending us a prophet. A mail man is paid to do a fairly simple task that they can quit whenever they want. I also love the song Follow the prophet it motivates me to have faith that what the prophet is saying really comes from the Lord instead of doubting everything they say. Small things I like that you said are to be aware that your listening to the spirit when the prophet speak and feeling that confirmation for myself. However I don't like trying to listen with pessimism waiting to catch them on saying something wrong. They're going to say something wrong they're not perfect. Why look out for it and take note of that? Why not use all my energy to focus on listening to the spirit and what he has to say? The spirit can speak to us even when the prophet say something not perfect because the Lord can teach us the truth. Cider might be some typos in here and I didn't get to write deeply about all my thoughts because I've got three little kids who are starting to drive me crazy so I'll say goodbye for now. The main thing I appreciate from this article is just paying attention to where my heart is at. Am I standing up to honor the prophet because I want to worship him or because I Want To Worship the Lord and show respect for the servants he sent? Agreed. I have to say I have always found Kimbra's articles refreshing. However, in this case my thoughts align much more with Katie's. I certainly could never liken a Prophet, anointed seer and revelator to a Postman! Dear friend, this is Megan, but the blog won't let me switch the ID off of Jet. :) I hope I can share my thoughts as we have always had open communication. My thoughts upon reading this article were completely aligned with Katie's above (even before I read Katie's comment!). I understand generally what you are trying to say. But I don't wholly agree. You also lost me at the mailman analogy. I just think it doesn't work. Perhaps a more appropriate analogy would be that the prophet is like a very dear, beloved teacher--but even that doesn't give the prophet's authority and mantle adequate definition. But it may be able to help you feel a little comfort to think of it that way. In a smaller way, you would love and honor a dear teacher who changed your life through the better through his or her humble service. Members of the church aren't worshiping the prophets by loving and honoring them. Generally unlike a teacher, however, the messages a prophet "delivers" to us have been prayed over, fasted over, and prayed over again and comes by revelation. I attended a women's conference years ago at which President Hinckley's son-in-law spoke. He told of a conversation he had had with the prophet between general conference sessions years before. It was the conference when President Hinckley gave the talk about how men should treat women, specifically their wives and their daughters. (We were still in highschool then.) Between sessions, the family all met for lunch. President Hinckley's son-in-law had a quiet moment on the couch with the prophet. The son-in-law said something like, "That talk touched me and so many people! Leaving the conference center, I heard man after man talking about the message you delivered, saying it was what they needed to hear and that they felt inspired to honor their covenants more deeply." President Hinckley sighed and began to cry. He explained, "I spend months and months fasting and praying and attending the temple, seeking revelation to know what the Lord needs the members of the church to hear. It mean a lot to know at least one person listened." Now, let me be clear. I can't quote President Hinckley's exact words so don't judge my retelling of them. The point wasn't that he felt vaunted or all important upon hearing this but that he felt humbled that he had done everything we could to help bring even ONE SOUL to God, as described in D&C 18: "And if it so be that you should labor all your days in crying repentance unto this people, and bring, save it be one soul unto me, how great shall be your joy with him in the kingdom of my Father!" So that is why I will continue to sustain the prophet and apostles with MY ENTIRE HEART--not worship, but SUSTAIN. I am indebted to them for what they do to help me turn my heart to God and know how to draw closer to Him. I am not naive. I know that the leaders are mortal and make mistakes. But when acting under the authority of their sacred office, which I have a testimony of, they become the mouthpieces of the Lord. "Whether by my voice or the voice of my servants it is the same." That authority should not be dismissed or reduce to anything less than that of a seer and a revelator. I think your point is well taken that the commandments originate with God, and that the purpose of a prophet is to convey God’s will to enable us to better follow those commandments. I also believe that prophets are fallible and occasionally make mistakes. For example, before the revelation on the priesthood, Bruce McConkie, as an apostle, said that blacks would never receive the priesthood and that the ban was a doctrine approved by God. Afterward, he frankly admitted that he had been wrong. Now, of course, the church has published essays admitting that the ban was based largely in racism. I don’t believe that members that disagreed or questioned Elder McConkie’s earlier statements in the moment were wrong for doing so, and ultimately they were vindicated. I’m sure there are similar situations occurring today. As for the idea of looking only to Christ, and not to prophets, as examples, the scriptures themselves are full of examples of mortal prophets that were commanded by God to act in a way that typified Christ. For example, Abraham, Moses, and Mechizedek were all types of Christ in one way or another, and their experiences are recorded for us to learn from their actions to become more christlike. Similarly, Lehi directly admonished his younger children to follow the counsel of Nephi, so they could stay on the straight and narrow. So we should not be dismissing the words and actions of prophets, who have been called to lead people to become more christlike. They are more than simple messengers. They can be types of Christ, and their examples can show us how to be christlike. It’s OK to recognize mistakes, and even to disagree with certain counsel, but I don’t see a problem with revering a prophet because of the position God has asked him to fill. I have to agree with the sentiment of those who have commented before me regarding the heavy handedness of comparing a prophet to a mailman. Even though our General Authorities receive healthy living allowances, they do waste and wear away their lives for the work of the Kingdom. And at the very least merit our respect, and even a healthy portion of admiration, for they are men of the highest caliber, albeit they are imperfect men; all the more reason, because each has lived an exemplary life worthy of admiration. But to take that to the extreme, which sadly many LDS members have done, is, as you say – idolatrous. And I believe that is what your article does a tremendous job of warning. Thank you for your boldness. You have eloquently articulated this subject, and we would do well to check ourselves in this matter, for far too many are blinded by the celebrity and cult behaviors of Mormonism and are guilty of idol worship. I have witnessed this lately in more ways than one, and it has made my heart sick to see the reality of it so prevalent in our culture. Just recently at the Tucson Temple dedication I could see that President Uchtdorf had “breathed it in” as the cult following and celebrity has gone to his head. How could it not with literally thousands of adoring fans adulating to almost nauseating levels. What was more sad, was that just ten feet away from him stood his unnoticed, almost ignored, quorum member Elder Stevenson…who? Yes, it was that noticeable. It was sad. 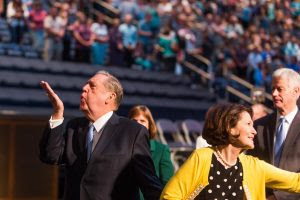 President Uchtdorf waved to the adoring crowd like a rock star, and spoke over the microphone faining humility to the crowd, all the while Elder Stevenson, not ten feet away was all but ignored, silent, in the shadows of his better looking, more adored traveling companion. It was obvious President Uchtdorf had breathed it in, as did so many in the crowd. 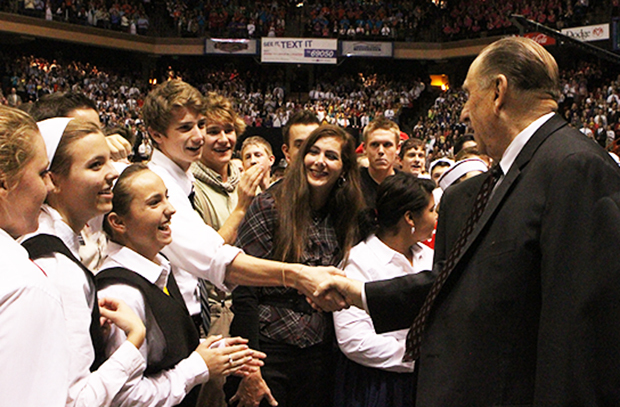 I’m really surprised a chant of, “Uchtdorf, Uchtdorf, Uchtdorf!” didn’t break out. It was that over the top, and I’m usually not one to notice such things. But what has been even sadder to me is how so many members of the church have begun to worship other idols – like temples. And then the Stake President gave an entire talk about the Mesa Temple and its history. What a wonderful talk about the Mesa temple. It was so full of tremendous details about the many years the Mesa Temple has been open. But not once in the entire talk was the purpose of the temple mentioned, and even worse not once was the Savior mentioned. It was an entire talk about how much we love and adore and will miss the Mesa Temple. Appropriate? Yes. But are we a church that worships temples, or are we a church that goes to the temples to do ordinances? In the D&C it says that godliness is manifest in the ordinances, but not once does it say that anything remotely close to the same about temples. Temples are just buildings. We don’t worship temples. But if you were to be in some of the Sunday school classes I’ve been in lately, you’d have to wonder. Just a few weeks ago in the class about baptisms for the dead the entire lesson was about how wonderful it is to finally have a temple in Tucson, so we can do temple work, and how the temple makes people feel, and how we can take our children to the temple grounds, and how the temple, temple, temple, temple…. (It was almost an Uchtdorf chant). Now, don’t get me wrong. I love the temple. And I am grateful that Tucson finally has a temple. But I do not worship it. The temple doesn’t have the Spirit. The temple doesn’t do the ordinances. The temple doesn’t seal families together. The temple doesn’t do any of those things. The temple is just a building, albeit a dedicated and consecrated building where sacred ordinances are performed therein, but it is just a building. What I have noticed is that many members of the church talk about the temple as if IT IS the thing that saves, as if IT IS the thing that has the Spirit, as if IT IS the thing that does the ordinances. IT’S NOT! The entire building testifies of and typifies Christ in every minute detail – the ordinances, the symbolism, the Spirit within, everything. Not instead of Christ, not a replacement for Christ, but to point us TO Christ. And when we stop short of Christ and ONLY talk about the temple, then we even diminish the purpose of the temple in the first place, and I believe we again are idolatrous. And isn’t that just what the great deceiver would want? He’s not going to get us to do any grave sin, no, he’ll just get us to be one degree off. He’ll get us to adore idols…and carefully drag us down to Hell, all the while thinking all is well in our behavior – the whole time at ease in Zion. Thanks a lot for your comments. You might also want to include D&C 52:39 "Let the residue of the elders watch over the churches, and declare the word in the regions round about them; and let them labor with their own hands that there be no idolatry nor wickedness practiced." Saving that one for my next post. Thank you for reading! Agree 110%. We are idolatrous and have great need of repentance and forgiveness for this grave sin. I witnessed dancing as you described in Philadelphia, at the temple celebration. Then there was the finale of arms raised in worship of a cardboard "temple", by hundreds of teens who would be in the new temple district as part of the dance routine. I have pictures of their arms raised, just as in the artwork depicting the children of Israel worshipping the golden calf. How we members justify it leaves me in disbelief. What will it take for us to repent, when most staunch members have no problem with it? Probably an act of God. To greater illustrate this image, I created a post for the reader. http://www.amajorshift.com/2017/10/awake-awake-stand-up-o-jerusalem.html Forgive me if it's tacky to share a blog post on yours, but I think it expresses your point even further. I completely agree. You had so many good points, all backed by scriptures. I'm sad that the new curroxulum focuses on conference talks rather than tje scriptures. Put the focus back on Christ as it should be. Are You Forsaking Those Sins?